I stayed up until midnight watching election results last night. I was watching results on four cable stations, reading tweets, texting with a buddy, blogging, and gorging on politics in general. Trés geeky, I know. It's fun to be hooked up on the Internet with other political geeks, some of whom are far more geeky than I. It's funny looking at my Twitter feed to see who was up all night. 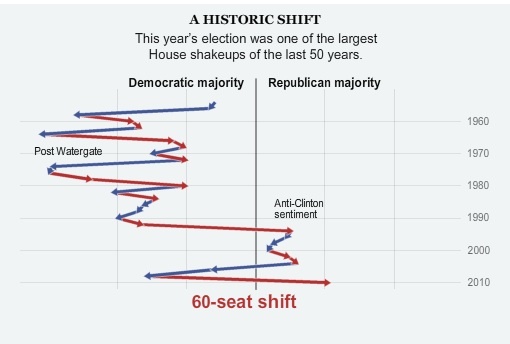 Nate Silver is predicting the Republicans will pick up 65 seats in the House. More than was predicted. The Senate will stay Democratic by a hair. There were some devasting losses, including Russ Feingold from Wisconsin. The Republicans will gained another 8 gubernatorial spots, which is going to have long term affects, because of redistricting. So, what does it all mean? I'm not sure if this election should be understood as a mandate for the Republican agenda. The careening voting patterns of the past two elections seems to be more of general distrust of government and politicians, and a deep frustration with the status quo, rather than an endorsement of a particular political agenda. I look forward to reading commentary throughout the day, after people get some sleep and drink a pot of coffee. UPDATE: Looks like Prop 19 went down in CA. Andrew Sullivan has reacts. 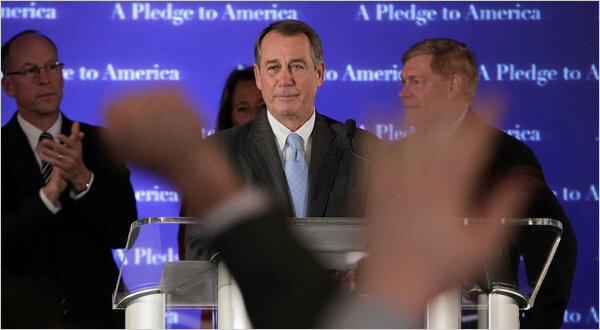 What will be the first move of a Republican House? Will it try to dismantle ObamaCare? Megan McArdle thinks they might have a shot at it. JPod says they won't be able to do it. Maureen Dowd writes, "Republicans outcommunicated a silver-tongued president who was supposed to be Ronald Reagan’s heir in the communications department." Yeah, I think they did, too. It's too bad that Obama put aside the soaring rhetoric when he put on the policy-wonk hat. It's also too bad that Dowd's communications skill failed her, because I can't figure out what she's driving at in this column. UPDATE2: Really sorry that I missed Paladino's speech last night. Apparently, he showed up with a baseball bat. Thank you, Tea Party, for moments like this. Ezra Klein thinks we're looking at Congressional deadlock. "From the perspective of actually getting anything done in the next two years, there was perhaps no worse outcome. Republicans don't fully control Congress, so they don't have enough power to be blamed for legislative outcomes. But Democrats don't control the House and they don't have a near-filibuster proof majority in the Senate, so they can't pass legislation. Republicans, in other words, are not left with the burden of governance, and Democrats are not left with the power to govern. Republicans don't have to be responsible, and Democrats can't do it for them." I nearly done with this, folks. I'm going to write a series of kiddie and shoe posts next, because my head is going to explode. That's from the Times. They have other goodies. Check out the sea of red here. Hey, what's going on in Alaska? Ah, looks like Murkowski might have it. If she wins, this will be the second time in history that a write-in candidate won a senate seat. Big hit for Sarah Palin. hee-hee. UPDATE4: How this election will impact education reform. I’m not sure if this election should be understood as a mandate for the Republican agenda. If we had my preferred form of election system–namely, a more parliamentary one–then the simple fact that the Republicans won so large would, in itself, give them a degree of mandate power. But under our system it won’t, in part because they don’t appear to have a Gingrich to turn their anger into a majority plan for governing. As for the symbolic “mandate” that the media swoons over, let them enjoy it. Maybe they’ll be able to magically turn the victory glow into a strategy, but I’m doubtful. I voted straight ticket Republican and I distrust them only maybe 5% less than the Democrats. The Republicans have a mandate to go out and get in the way of things, which is about all I think they can do because of internal divisions. Obviously, the Dems have their own internal divisions, but these are mostly the regional/racial/ethnic splits they have always had, most of which can be linked or de-linked to buy-off whoever. The Reps divides are going to be harder to deal with because they are more central and newer. They ran on fiscal responsibility and lower taxes and Medicare, which is pretty much stating that your official party platform is either Dadaism or obstructionism. Henry already had a post titled The Name of This Band is Exploding Heads. I’ll be looking forward to more politics when the hangover lifts. An all-out attempt to repeal ACA would be good fun. Can we talk more about 40% premium increases, recission and medical bankruptcy? That’d be great politics. Reagan’s approval ratings at the equivalent point in his first term? Low 40s. Also? The complete unknown running as a D in SC got 28%. Looks like Crazification is alive and well. Other than the criminal accusations, he seemed like a nice enough guy. Anyway, I was so ready to go to California for legal pot and now there’s no point. I’ve already seen Disney Land and Napa. There go the opportunities for some Vitter-Greene Acts. It’s only a matter of time before you hear Mark Shields interview Senator Sheen. The Times chart is pretty, but does it go back far enough? No graphic, but the analysis covers the full run. I’m not really on board with calling something that happens at least every 20 years, and usually more often, “historic”. Wouldn’t do it in non-partisan media, anyway. Doug, it really does seem that in politics the variance was sort of tamped down from the 40’s on, but now things are unmoored again. It reminds me a bit of the way everybody thought the business cycle was moderating until all of a sudden it wasn’t.